Despite record-breaking levels of global displacement, the Trump Administration has drastically reduced refugee resettlement since taking office. The United States welcomed only 22,491 refugees in Fiscal Year (FY) 2018—a 71% drop in resettlement from 2016 when 84,994 refugees were resettled. The United Nations Refugee Agency estimates that more than one million refugees globally may currently need resettlement. Yet in September 2018, the Trump Administration set a refugee admissions ceiling of 30,000 for FY 2019, the lowest in the history of our nation's resettlement program, after a previous low of 45,000 in FY 2018. Halfways through the fiscal year, the administration is not on track to meet even this low threshold. In the first six months of this fiscal year, the United States resettled only 12,151 refugees. At the current rate, the Trump Administration will resettle 71% fewer refugees than were resettled during Fiscal Year 2016. Secretary of State Michael R. Pompeo claimed that the United States is “the most generous nation in the world when it comes to protection-based immigration” citing U.S. resettlement of refugees and processing of new and pending asylum cases. 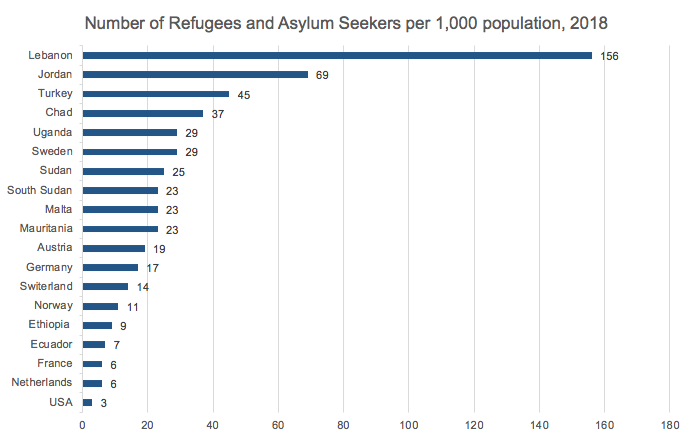 But even considering these figures together as a measure of the U.S. commitment to admitting refugees, the United States lags far behind many refugee resettlement and frontline refugee hosting countries that protect far more refugees and asylum seekers on a per capita basis. Although there have been decreases in admissions across all religions, at the current rate in FY 2019, admissions for Muslims are down by 90% compared to FY 2016. In FY 2016, 46% of admitted refugees identified as Muslims, however so far in FY 2019 only 15% of admitted refugees identified as Muslim. In the first months of 2017, President Trump implemented refugee bans, which barred refugees from 11 countries, including 9 Muslim majority countries, from entering the United States and resulted in steep declines in refugee resettlement. While the refugee ban was officially lifted in January 2018, additional “security measures” adopted by the Trump Administration continue to severely impede the resettlement of refugees. Only 608 refugees from the 11 banned countries have been admitted to the United States during the first half of FY 2019. In comparison, 36,952 refugees from the 11 banned countries were admitted during FY 2016. Notably, only 168 Iraqis have been admitted so far during FY 2019, which includes U.S.-affiliated Iraqis. Currently the backlog for P2 Special Immigrant Visas for U.S.-affiliated Iraqis is approximately 100,000 people.